What getting caught in a fence can do to a horse: Peggy Sue's leg before surgery to prepare it for a prosthetic. Dr Vlahos bandaging Peggy Sue's leg. The rescuer of a young quarter horse filly who is about to be fitted with a prosthetic leg is hoping for the same success as another horse who was recently fitted with an artificial limb. As a two-month-old, quarter horse filly Peggy Sue's leg was caught in a fence. 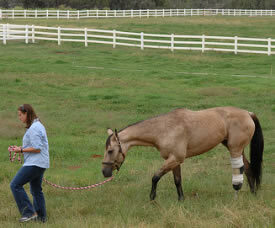 Her tendons were slashed in the accident, and she lost her fetlock and hoof. She was acquired from her original owner by Kady Boe, who was struck by Peggy Sue's will to live. She is determined to give the filly a second chance at life. Boe has a fundraising goal of about $16,000 in total, and already about $3000 has been donated. She has taken Peggy Sue to Dr Ted Vlahos, a surgeon in Sheridan, Wyoming, who has successfully fitted horse amputees with artificial legs and was one of three veterinarians who pioneered the procedure. The first step for the two and a half month-old filly was to have her leg cleaned up, and Dr Vlahos had to saw off most of the cannon bone, and then clean and debride the area. "He then made sure the nerve endings were up high to prevent sores when she gets her prosthetic, and he pulled skin down and over to close up the bottom," says Boe. "She is now in a cast for a couple of weeks but doing awesome. Once her stump heals she will then get her first prosthetic." Peggy Sue should keep this prosthetic for about nine months. Boe's next goal is to raise another $4000 by November 30 to cover the cost of the limb. Donations are being accepted by Paypal. In September, a mare named Riley was successfully fitted with a prosthetic hind leg. Riley had arrived at the Best Friends Animal Sanctuary in Utah in 2004, with a severe cut on her nearside hind leg. 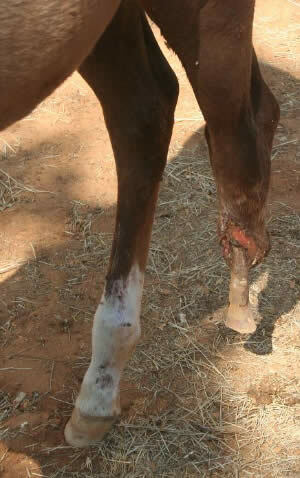 Scar tissue formed, causing her tendons to contract to such an extent that her fetlock was pulled out of place. The best option at the time was to surgically insert a metal plate into her leg to fuse the fetlock and straighten the leg. This worked for a few years, but the plate became contaminated and an infection developed around it, causing the bone to deteriorate. Removing the plate and putting in a new one wasn't feasible because it would entail removing bone that had grown around the plate, which would have destabilized the leg even more. Veterinarians Ted Vlahos and Tara Timpson inspect Riley's new prosthesis. Riley became a media darling during her stay in Wyoming. Jen Reid, who manages Horse Haven at Best Friends, and veterinarian Tara Timpson contacted Dr Vlahos in Wyoming, and he agreed to take a look at Riley to see if she would be a good candidate for the prosthetic. The horse also needs to have a strong opposing leg because she would be bearing much of her weight on that leg until she adjusted to the prosthesis. "Riley has always been an amazing patient," Timpson says. "We knew we needed a horse like that to be a good candidate for this procedure." Vlahos determined that Riley fit all the criteria, and offered to perform the procedure at a generous rate. To help pay for the operation and the prosthesis, Riley was admitted into Best Friends' Guardian Angel programme, which helps animals in need of costly medical care. A single benefactor covered all of Riley's expenses. Vlahos amputated Riley's her leg at mid-cannon bone and fitted her with a temporary prosthesis - one of three she received while the swelling in her stump healed. Soon after the procedure, she was trotting, running and even playing, as well as easily bearing the weight of a young rider. While in Wyoming, Riley also became something of a celebrity, stopping traffic and causing people to get out of their vehicles, stare, and take pictures of the horse with the titanium limb. Now that Riley is back at Best Friends, she is "doing everything a normal horse would," Reid says. "She's eating great. She takes lots of naps. She likes to flirt over the fence with her male neighbour." Each year, thousands of horses are euthanized for reasons very similar to those that necessitated the amputation of Riley's leg. Nowhere has that fact been more apparent than at the racetrack, where Eight Belles, Barbaro and countless other thoroughbreds have been put down immediately after breaking a leg. As Riley now shows, horses' lives don't have to end that way. "The ideal candidate for prosthesis is the thoroughbred racehorse because they're incredibly fit," Vlahos says. "We really feel that it's old school to quit on these horses." He stresses that this procedure isn't for every horse with a broken or severely infected leg, but feels many horses can be saved from a death sentence if people simply know that the prosthesis option is there. Currently, two other veterinarians, Dr. Barrie Grant of California and Dr. Rick Redden of Kentucky, perform the procedure. Vlahos believes that eventually the prosthesis option will become a common practice. "We're hopeful that horses like Riley will get the word out that we don't always need to kill them," he says. "We have thousands of guys who come back from Iraq with amputated limbs. We don't throw them away, and nor should we with horses."